The Interactor is one-of-a-kind virtual reality vest that adds the third dimension of feeling to video games, kicks, slam dunks, explosions and more. 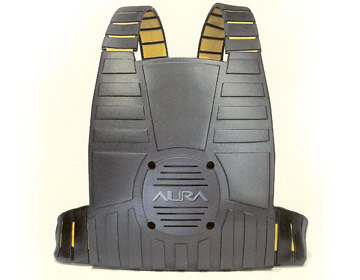 Interactor works by checking out your game system's audio output and turning it into body-pulsing vibration, using the same cutting-edge magnetic actuator technology developed by Aura systems for the U.S. military. The Interactor has received the Innovation Design and Engineering Award from the Electronic Industry Association, The International Consumer Electronics Show®.